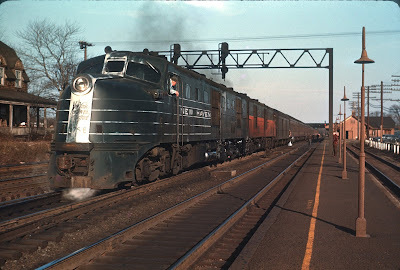 While my main project is replicating The Valley Local, the New Haven's heavy-duty Shoreline mainline figures prominently as well - at least the part that goes through Old Saybrook, CT. And during the era I model (1947-1949), almost all of the 71 trains that pass through Saybrook each day are powered by the New Haven's class DER-1 locomotives - a.k.a. Alco DL-109s. Fortunately, Proto1000 (now Walthers) produced a very robust HO scale model of the DL-109. It's certainly no Rapido locomotive - heck, it's not even as detailed as a Proto 2000 engine. But those molded-on grabs & railings make them perfect for frequent handling by my Shoreline operators. So I have an even dozen of them to run my Shoreline trains. But there are a couple of problems: 1/2 of my DLs are at a friend's house being decodered and weathered (along with a beautiful pair of PAs which will hopefully show up soon to squire the Yankee Clipper), one of them is a brass model that will need some reworking, in addition to decodering, and one of them runs very intermittently and I haven't been able to figure out the problem yet to fix it. So that leaves me with only four units - two back-to-back pairs that basically handle about 80% of the Shoreline trains during my ops sessions (a couple steam engines "taken out of semi-retirement" handle the remainder). 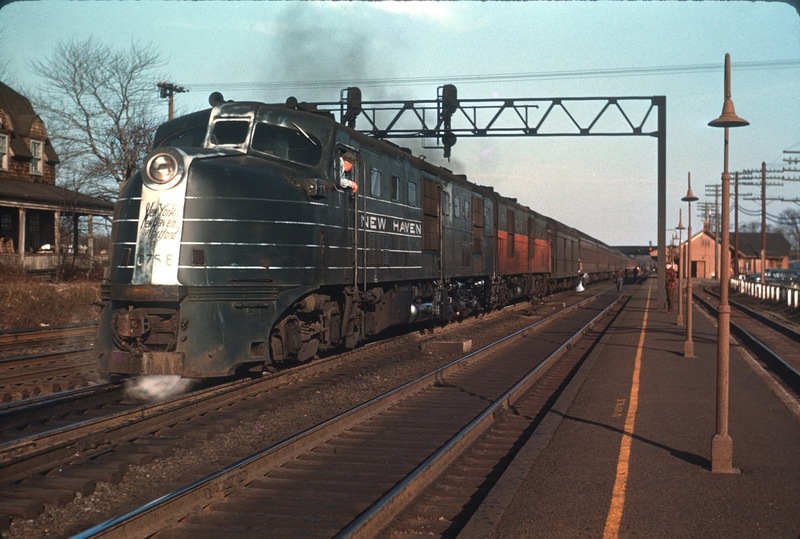 Again - and luckily - the prototype helps out here too: During the 1940s, the New Haven practically ran the wheels off their DER-1s sending them back and forth between New York and Boston. I actually have documentation showing pairs taking passenger trains one way in the morning, and the same pairs going back the other way with a freight train that evening. Yup - that's some drop - and they're ALL like this. Note how the entire coupler box is slanted downwards. Now, it's usually not a problem - but when it is, it's usually on some fancy name train. Paying passengers don't like being unceremoniously left in the (staging) yard while they watch their locomotives pulling away without them. So what's the Motive Power Department to do (other than get more DER-1s into service)? They Fix the Problem. 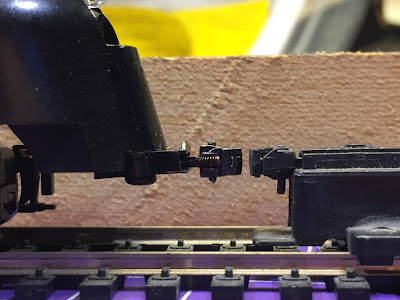 I considered a number of different solutions, including shaving down the top of the stock coupler box (wouldn't be enough), bending the coupler up (too risky that you'll break it), getting an offset coupler (would look bad, I'm too impatient to wait for them to come in, and they'd probably end up too high so I'd have to shim to lower them). But I finally decided to bite the bullet and "just" install a new, thinner coupler box. Tighten screw against the strip styrene. Start by flipping the engine over and putting it in a nice foam cradle. The coupler mechanism is actually pretty clever - that whole assembly swings from side to side to accommodate tight curves. You can just make out the curved piece of brass strip at the back of the coupler box that acts as a centering spring. You'll need to remove the body shell eventually, so may as well do it now. It's a simple matter of spreading the sides of the body away from the mounting lugs on the side of the frame. The mechanism slides right out. Weighing almost two pounds(?!) is both the good news and bad news for this engine. Good news for pulling power; bad news that the entire frame - and coupler box mount - is solid metal. Raising the coupler ain't as easy as just shaving away some styrene. Note that I'm resting the mech on "jack stands" of scrap 2x2 wood. I could have used the foam cradle, but I didn't want to risk any wires getting caught on the foam - and for drilling into metal, I wanted a really solid support. I removed the stock coupler box and curved brass strip, then replaced just the top of the stock box as a drilling template. The coupler mounting lug makes a nice drilling guide (keeping the bit perpendicular to the frame) and places the hole in the proper position. I drilled & tapped for a 2-56 screw, so I used a #50 drill bit in my Dremel (with flex shaft and foot pedal for control). It takes some patience, but using the Dremel is SO much better than using a pin vise. Just go slow and keep the bit lubricated (I rub it against some old bar soap) Thankfully, the metal is soft. Just be sure to back out your tap often to clean out the threads. 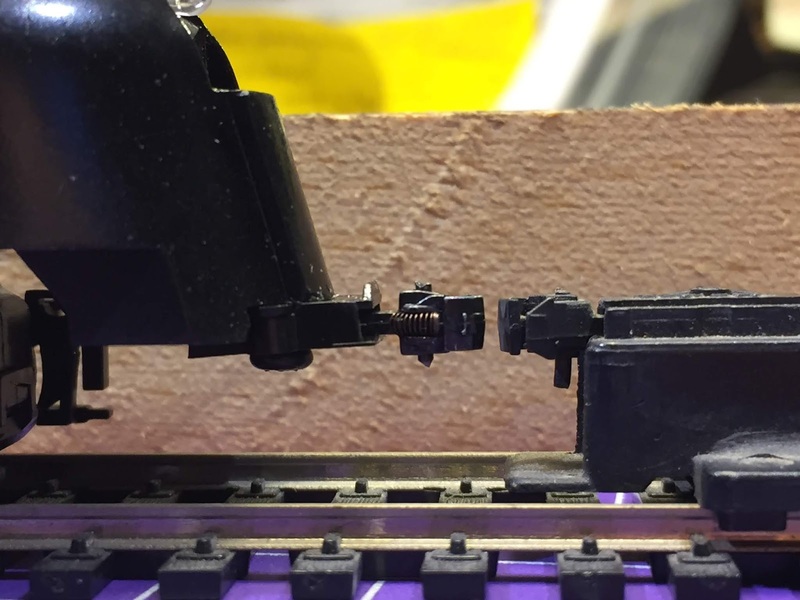 From that point, it was pretty easy - just assemble a KD coupler box with your coupler and screw it in. OH! One last - and critical - step: the styrene strip! Hopefully you noted in the second photo that the original coupler box actually slanted downward. I don't know whether that's due to the frame being cast slightly off or what. But the solution is surprisingly simple. Just insert a little strip of styrene under the back of the coupler box (between the box and the frame - you can see a sliver of white in the photo above) and then snug the screw down. I used a .020" thick strip, but use whatever you need to get your coupler to the correct height. May sound like an odd solution, but the proof is in the result. Compare the photo above to the one at the beginning of this post. It's pretty much dead-on. I just need to replace the body shell and this unit can go back into service. Now I only have 3 (or 8!) more to do . . . I hope you found this little tip helpful. And if you have any of the P1k DL-109s, I hope you'll let me know if you've had the same issue - and what you did to fix it.